Some conservative organizations are working to oppose the bid of John Boehner the Speaker of the House to win his 13th term. Three of his fellow Republicans are giving Boehner a primary challenge. That prompted Boehner to start spending money on television campaign ads in his congressional district in Ohio. 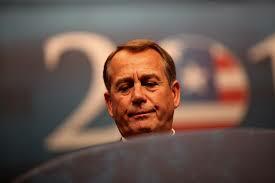 Boehner, the House’s top Republican is planning to spend as much as $125,000 for ads over a two-week period. While the House Speaker is expected to win his primary easily and then his re-election in November, the purchase of the ads represents the first time the leader in the GOP has aired commercials in his district in the Cincinnati area since 2010. In the ad of 30 seconds, voters from his district praise Boehner. One woman, who is older, said it made her proud to say her Congressman was John Boehner. Another woman says Boehner was fighting for working families like hers. Boehner aides have said the idea of buying television time was a way to help the Republican Party in Ohio and the candidates that are running for other offices like township trustee and county commissioner. A spokesperson for Boehner said Republicans have a great opportunity during 2014 and the Speaker wants to take advantage of that opportunity. The ad to run on television features only one photo of Boehner at the beginning and never mentions that he is the Speaker of the House, a role where he has helped to negotiate deals vehemently opposed by conservatives, including agreements that raised the borrowing limit for the nation. Some of the groups that are conservative had worked against the bid of reelection by Boehner. The Tea Party Leadership Fund earlier in the week spent over $4,000 making telephones calls to constituents. Another conservative group the Madison Project has made criticisms online of Boehner. The complaints of the conservative organizations is not new or even that worrisome for the Speaker. He fended off a 2012 primary challenge and won by 68 percentage points. That year he did not face any Democratic challenger in the election.